As if I didn’t look forward to Friday enough already! Doing these guest interviews on Fridays really makes me excited for the end of the week! If this is your first time joining us for Guest Interview Fridays, welcome. I’m so glad you’re here. If you’re a regular, welcome back friend, I’ve missed you! For those who may not know what these interviews are all about, I like to interview published authors to help us get a behind the scenes look at what it takes to write and publish a book. They have so much advice to give and writing tips to provide, I hate to pass up on all that. But then I started thinking about how it’s not just the author that’s involved in book publishing so I recently started branching out to include people other than authors in my guest interviews. Today is one of those branching out moments. They say it takes a village to raise a child, I think the same could be said for publishing a book. Today’s interview is with one of the “village people” that help get those books on our bookshelves (whether real or digital). Here with us, is editor Lisa Mangum. Lisa can you tell us a little about yourself? My name is Lisa Mangum, and I’ve been working with books my entire life. When I was in elementary school, I skipped recess in order to work at the library. I also worked at the Sandy library, then as a bookstore clerk, before I landed a job as a proofreader for Deseret Book. That was in the summer of 1997, and I’ve been at Deseret Book ever since. I worked as both an Editorial Assistant and an Assistant Editor before being named Managing Editor of Shadow Mountain (Deseret Book’s national market imprint) last year. It’s a little strange to see my 20-year anniversary so close on the horizon! As I mentioned, I like to give a behind the scenes look at this whole process so could you tell us a bit about what you do as a Managing Editor? In short, my job is to make sure our books are as perfect as they can be and that they go to press on time and on budget. Throughout that process, I’m able to do a number of different kinds of editing. I enjoy content editing the most; I like being able to work on the big picture of a story, look at the structure, take a manuscript apart and put it back together again. I also do quite a bit of line editing—grammar, spelling, and punctuation. I write jacket copy for books, give input on cover design, coordinate proofreading tasks, oversee corrections, as well as wade through the slush pile, looking for the next diamond in the rough. Through it all, I work closely with the author to make sure the book lives up to his or her vision. I also have to ask this next question or I’m sure I’ll never hear the end of it from some of my fellow authors who are looking to publish. As an acquiring editor, what are things you look for in the manuscripts that you eventually decide to acquire? I love a manuscript with a strong voice, vivid descriptions, and natural dialogue. I need a story with a compelling plot and strong characters who grow. It needs to be something I can fall in love with as an editor and as a reader. I also look for a manuscript that is free of obvious errors—a couple of small typos are forgivable, but if there are too many too frequently, then I’m more likely to pass on a project. You’re making me want to recheck my manuscript compulsively again. haha Even as a writer, those are all great things and I look for them in books too, whether I’m writing them or reading them. I know I’m always looking for ways to improve my writing. I’m sure you have some excellent resources you can point writers to, to help polish up their manuscripts. Could you name a couple off the top of your head? I like to refer writers to Editorium.com for the FileCleaner program and Editor’s ToolKit that is offered there (for a small fee). I’ve also heard good things about Smart-Edit.com, though I haven’t personally used it yet. Fantastic, I always love learning about new writing resources. Anything we can do to give our writing that extra bit of shine can help our manuscript stand out in the ever growing slush pile. Speaking of slush piles, do you accept unsolicited manuscripts and if so what genres are you looking for? Yes, Shadow Mountain does accept unsolicited manuscripts. We are looking for strong MG/YA fantasy and compelling contemporary YA. Excellent! And where might a writer go for submission guidelines to Shadow Mountain? All our submission guidelines are at www.shadowmountain.com/submission-guidelines/. That is also the page where you upload your submission; we are only accepting electronic manuscripts submitted via the website (so no mail submissions or email attachments). This is such a relevant topic for where I’m at in my writing journey right now, so thank you for indulging me. While we’re on the topic of submissions, maybe you could tell us something that you see that turns you off to a manuscript. Stories that begin with too much backstory is a definite turn-off. Low action and too much telling really bogs down a story and makes it hard to engage. I’m also less interested when a plotline feels cliché. I’m looking for originality. Originality is the philosopher’s stone for authors. Trying to find an original story idea is half the battle! But it’s always so great when an idea hits you and you know it’s something that feels fresh and exciting. How about other mistakes that you’ve seen in your vast experience. What is one of the most common mistakes you see authors make time and time again? Many authors struggle with proper comma placement. I’ll be the first to say that commas can be tricky, but being familiar with the basic rules of comma usage will help polish your manuscript like few other things will. I keep a copy of The Elements of Style nearby when I write and especially when I edit. But I’m still pretty comma placement challenged sometimes. Which makes me want to ask about a growing trend for writers. I hear more and more that authors are hiring editors before they submit their book proposals, is this something you think is valuable for writers interested in going the traditional publishing route? Yes and no. If an author is going the traditional publishing route, then no, you might not need to hire a freelance editor because at some point they’ll be assigned an editor who will comb through their book front to back. (Or they’ll find an editorial agent who will help as well.) But in order to get that agent or that editor, a manuscript needs to be in the best shape possible and that might mean hiring an editor to get it ready for submission. I do think a freelance editor can be a valuable investment for an aspiring author, but I also think an author should be wise about who they hire and how much they pay. Two editing services I recommend often are PrecisionEditingGroup.com and EschlerEditing.com. They both do great work at reasonable prices. Ah, the old ‘yes and no’ answer. A favorite of attorneys everywhere! But that was really great advice and as I’ve already mentioned, I love new resources! Having a reasonably priced editor that you can trust is always a good card to have in your deck. Now that we’ve discussed the difficulties you’ve encountered in your job, let’s see if we can’t balance it out a bit. How about the successes? If you can choose just one. I’m sure there are many things, but off the top of your head, can you share a story that highlights something you love about the work you do? I love finding a new voice in the slush pile, and one of my favorite “finds” was Ally Condie. Many years ago, she submitted the first three chapters for a novel entitled Yearbook and I instantly connected with her writing and her storytelling. I asked for the full manuscript. Then I told her to rewrite it—which she did. I read it again, and told her to rewrite it again—which she did. I read it again and knew that we had a winner on our hands. We published that book, plus the next two in the series, plus another two books by her, before she wrote Matched. Ally and I became really good friends during our years working together, and I still think she is one of the best storytellers I know. Another question I like to ask (when I remember to) is, what is one question you don’t get asked during interviews that you wish people would ask you? Alright, those who know me know I usually try not to be too serious. But before we close, if we could get serious for one last question. What piece of advice would you give to writers who are writing and attempting to get their work published? Follow your passion. Don’t write to a trend or a fad; by the time you finish your manuscript, the fad will be over. Don’t be the next; be the first. Write boldly. Write often. Tell your own story. Then take a step back and set your work aside and rest. When you come back to the story with editorial eyes, you’ll see so much more that needs to be fixed. Keep submitting your work because eventually someone will say yes. As the owner of a few shiny new rejection letters I love hearing that sort of encouragement and I love offering it to other writers who are going through it. Taste is subjective, just because one person doesn’t like something doesn’t mean there aren’t others who will like it. Don’t give up! And I think being passionate about it really helps with that. So your advice to follow your passion is spot on! Before I let you go, I know you have written a few books and I can’t end this interview without telling all my amazing readers out there where they can find them. Do you have some links you could share with us? You can find my books at Amazon.com or BN.com. 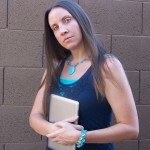 I’m also active on GoodReads.com, @LisaMangum, and on Facebook.com. Wonderful! Thank you so much for joining me for this interview. It was such a pleasure picking your brain, and what a lovely brain it is! Now, would you like that million dollars in cash or a check. I’ve always been a sucker for those giant ones everyone’s always giving out. Of course it will be postdated for after I become rich and famous, I hope that’s ok? Goodbye to all you brilliant people that clicked that little link to this marvelous interview. I hope you will wander around the rest of my blog for a bit if you haven’t already. And I hope you’ll join us next week for the next guest interview. There’s a new one each week!